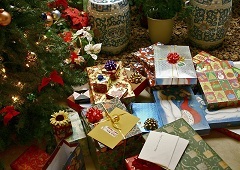 Christian Apologetics/Philosophy Book Gift List Christmas 2011 | J.W. Wartick -"Always Have a Reason"
Brian Auten over at Apologetics 315 has an excellent post which outlines some great gift choices for Christian apologists. I thought it was an great idea and wanted to expand on it. Thus, welcome to the inaugural, annual Christmas Christian Apologetics and Philosophy Book Gift List! That is a mouthful! The following list suggests several books for beginner and intermediate readers, a couple for advanced readers, and 2 books I think that anyone interested in apologetics or philosophy of religion will enjoy. Hugh Ross, Hidden Treasures in the Book of Job– A phenomenal book about the scientific intelligence of the book of Job, the oldest book in the Bible. See my review here. Komoszewski, Sawyer, and Wallace, Reinventing Jesus– This book is, in my opinion, the best introductory work on apologetic issues related to the historicity of the New Testament. I can’t recommend it highly enough–it covers gnosticism, the canon, the Gospels, etc. It’s simply phenomenal. Gary Habermas, The Case for the Resurrection of Jesus– Habermas’ defense of the historicity of the resurrection is top-notch, easy to understand, and, I’ve found, irrefutable. The best part about it is that it focuses on three easy-to-remember facts about Jesus. William Lane Craig, Reasonable Faith– An intermediate-level book on natural theology, Craig here presents a convincing, reasoned defense of theism generally and Christianity specifically. This was the book which got me into apologetics. I highly recommend it. Beginners will be happy to know Craig has distilled his work here into his readable On Guard. Greg Koukl, Tactics– This book provides a background for apologetic method. Koukl’s insight will quickly train readers to analyze arguments, find fallacies, and point them out, all with a kind of gentleness and respect which is fitting for the Christian Apologist. I recommend this book very highly. No collection is complete without it. Stephen Parrish, God and Necessity– Parrish’s phenomenal work of philosophy of religion surveys the notions of contingency and necessity. He analyzes various theistic arguments, offers an ontological argument, and finds that only in the necessity of deity can we explain the existence of all things. The scope of this work is immense–it covers a broad array of metaphysical issues. I recommend it highly. Linda Zagzebski, Divine Motivation Theory– Zagzebski explores a range of issues regarding metaethical systems and finds that divine command theory needs modification. She offers her own theory for the grounding of morality in the divine, which is backed by motivations, not commands. There’s a reason Zagzebski is getting recognition and causing stirs in the world of philosophy of religion. Check out my review of the book. Douglas Groothuis, Christian Apologetics– I believe this book will quickly become the definitive work on Christian Apologetics. It’s comprehensive, eminently readable, and convincing. Beginners might be scared off by the sheer size of the book, but it provides enough background to appeal to any reader. The succinct nature of the arguments, the reasoned defenses of the premises, and the immense ground the book covers will make it appealing to all. Edgar Andrews, Who Made God?– I have to agree with Brian Auten (see the article linked above)–this book is simply phenomenal. Readers at any level will find new ideas of great interest. Andrews covers a wide range of issues, all of which are of interest to Christian apologists and philosophers. See my review.